PULLMAN, Wash. – With support from a $1.6 million grant, a new faculty member is studying people’s beliefs about whether intelligence can be increased and how this shapes attitudes, behaviors and expectations. By examining beliefs about intelligence, Ehrlinger is trying to understand the barriers to learning that may come from inside our own heads. 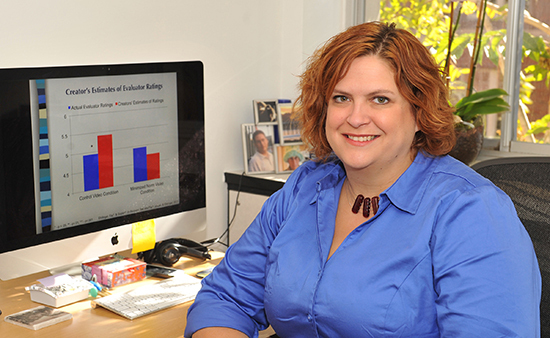 “This research has far-reaching implications in terms of the way we educate people at all levels, and even the way people’s career trajectories develop,” said Rebecca Craft, professor and chair of the Department of Psychology. Through her post-doctoral and ongoing work with Carol Dweck at Stanford University, Ehrlinger has found the way students perceive their intellectual abilities—either as fixed or with growth potential—affects not only their grades but their anxiety and confidence levels, too. These self-judgments can make learning a challenge or a joy. For someone who believes intelligence is fixed, struggling with a task means that person inherently lacks capability. But to someone who believes intelligence is changeable, struggling is just a necessary step toward attaining knowledge. “It’s breaking new ground to understand more of the science—the science of how the mind works, the science of how belief systems form and how these beliefs affect behavior and outcomes,” Ehrlinger said. In the three months since she came to WSU from Florida State University, Ehrlinger has established new lines of related research and collaboration with university colleagues. She hopes to collaborate with high school administrators and teachers in the surrounding communities “who are interested in new tools that can help kids learn,” she said. Her work with Pullman High School will introduce students to strategies proven to improve math skills. “By teaching students to approach math with a growth mindset, we can improve their enthusiasm about math and help them raise their grades and test scores,” she said. Recognizing the particular obstacles faced by female and minority students in STEM (science, technology, engineering, math) disciplines, Ehrlinger hopes her research can be applied to improve their participation and career success. This new line of research is supported by a grant from the Institute for Education Sciences. Learn more about Ehrlinger’s research at http://joyceehrlinger.com/Research.html.